My daughter is half way through her pregnancy and had that all important ultrasound this week. All is well and now we know if it is a boy or a girl! Can you guess? I thought I would share our exciting news with you by offering some pinkilicious blog candy. Your bundle will include two stamps: Packed for Baby and Packed for Mom as well as some pink buttons and 4 yards of pink ribbon. There is also a bundle of 50 6x6 Designer Paper Squares in all shades of Stampin' Up pinks from Pretty in Pink to Rose Red. And now the name game begins for our little bundle! I will announce the winner on Wednesday, April 25th! Combining Concord Crush and Daffodil Delight results in one loud Happy Birthday for sure! But the best birthdays are not always the noisiest ones. My husband brought our newborn daughter and me home from the hospital on my birthday. It was freezing cold, snowing and almost Christmas. There was cake, a Christmas tree and that beautiful baby girl. Best birthday ever! Play at Pals Paper Arts this week using Margaret Moody's terrific sketch! This card is being sent to a wonderful couple who just welcomed beautiful twin boys into their family. 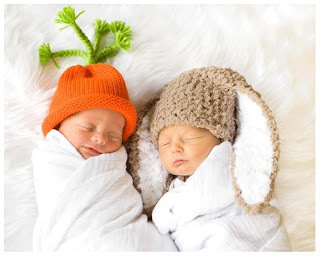 They arrived home Easter Sunday just in time for a photo shoot in their Easter bonnets! Two sweet! The colors used were from the challenge at Create with Connie and Mary. The SU-Only Challenge this week was the create a congratulations card. I sat down with a Freshly Made Sketch on my desk and Bones on TV. I pulled out Summer Smooches DSP, Whisper White and started my design. I attempted a rosette out of Lucky Limeade but it did not go well. Soon my plans for a rosette and a Daffodil seam binding bow were tossed - literally. Onward to Field Flowers and into an episode of House! I stamped and snipped flowers in Rich Razzleberry - didn't like them. Next Island Indigo - mmm nope. Tangerine Tango, Real Red - nope, nope! Finally - Daffodil Delight! I kept those flowers and tossed the rest. Then I spied that seam binding again. But it was also time for Smash! I edged the half circle with sticky strip and ruffled the seam binding as I watched those Broadway babies. Good thing I had red plastic strips to throw away because there on the floor was a scored piece of Lucky Limeade that had missed the wastebasket! 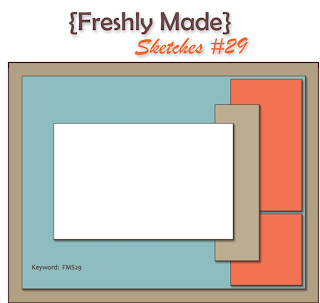 Perfect for my middle panel! I edged it with the Pinking Hearts Border - didn't like it. Trimmed the edge and punched again with the Scalloped Trim Border - much better! Smash ended so I turned off the TV and studied my unfinished card. Nothing was adhered and there were no embellishments. But suddenly things began to come together quickly! Pearls, flower brads, linen thread, dimensionals - I was on a roll! 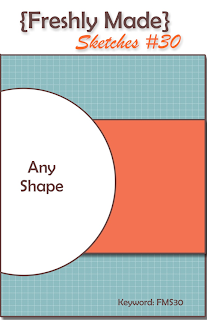 The white card base no longer worked for me so I switched to Lucky Limeade and rounded corners. Done! Maybe I should have turned that TV off sooner! How long does it take you to make a card? Faster than me I am sure! 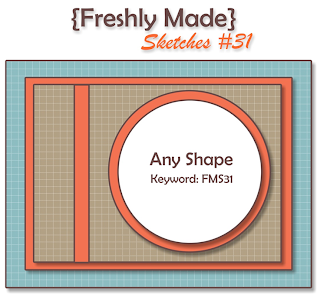 Hope you join us at Freshly Made Sketches! This card is headed west to wish my 86 year old aunt a Happy Easter. I told you the story of her two sisters with the same name in this post and thought you might like to hear about her name. Aunt Nell is the youngest of my father's family and was born in America after the family came over from Holland. She was christened Petronella and my grandparents called her Nellie. Nellie hated the name and took a stand at an early age and insisted on Nell. At the age of 20 she left upstate NY behind and headed west to LA. The first thing she did when she got there was to tell everyone her name was Pat. And just like that she was Pat to everyone - except for the family! When I visited her recently in California, she said I was the only person left on the planet who still called her Nell. I told her that Aunt Pat just didn't sound right to me even after all of these years. To which she replied: "I know what you mean. I always regretted not telling people when I got here that my name was Christine." Say what??? 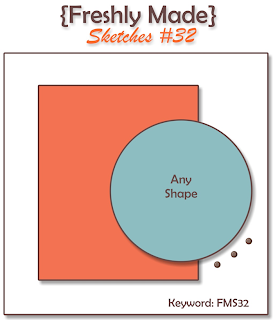 Pals Paper Arts has a wonderful spring color challenge this week! I wonder if Momma Duck has noticed yet that her ducklings have been fooling around with the Easter egg dye? I totally understand Momma Duck - it's not easy keeping your ducks in a row! The Paper Players are looking for cards that make you smile this week so I incorporated that idea in my Freshly Made Sketch. I kept the card simple because it was going in the mail. It is off to to my mother in Florida - hope it makes her smile!